2018 Panini Limited Football marks another installment for one of the hobby’s earliest high-end brands. It has evolved from the early days of foil into something more modern. And in the high-end sphere, that means autographs and memorabilia cards. Each three-pack box of 2018 Panini Limited Football has a pair of autographs plus one memorabilia card. Of these, one is a Rookie Patch Autograph. The product starts with a 100-card base set highlighting NFL veterans. Parallels come in Silver Spotlight (/99), Gold Spotlight (/49), Ruby Spotlight (/25), Amethyst Spotlight (/10), Emerald Spotlight (/5) and Sapphire Spotlight (1/1). The one-per-box Rookie Patch Autographs have on-card signatures and come in a couple of different forms. 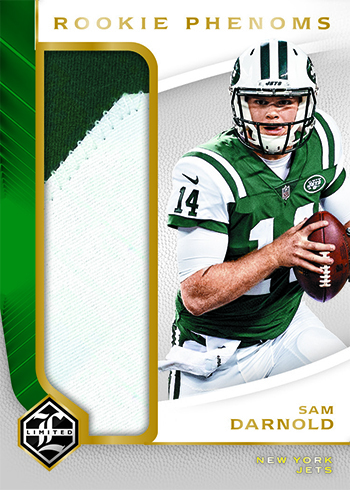 Base versions have 299 copies or less with Silver Spotlight (/75), Gold Spotlight (/50), Ruby Spotlight (/10), Emerald Spotlight (/5) and Sapphire Spotlight (1/1) parallels. More than 30 rookies are on the checklist. Select players also have Rookie Patch Autograph Variations (/199 or less). Parallels come in similar forms as the regular cards only with smaller quantities for the more common ones. None of the RPA parallels are numbered higher the 25 copies. 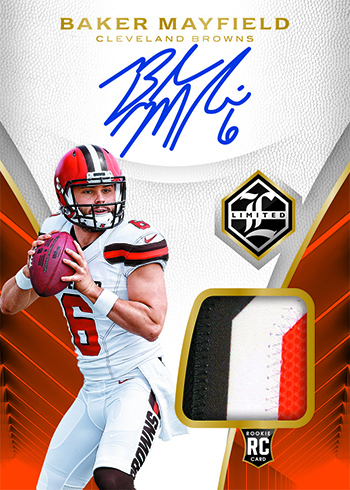 Keeping with the first-year players, Draft Day Signature Booklet cards (/55) pair a signature with a piece of the jersey players held moments after having their names called out at the 2018 NFL Draft. One-of-one Sapphire Spotlight parallels come with a Nike Swoosh. 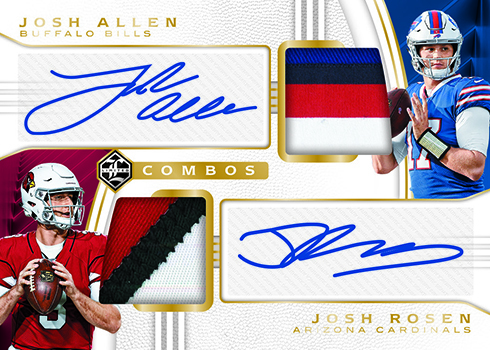 Dual Patch Auto Combinations (/50 or less) have signatures and premium swatches from two players. Parallel versions come in four tiers, all /30 or less. On the strictly autograph front, Unlimited Signatures (/99 or less) have a mix of past players and current stars. Ring of Honor (/99 or less) highlights signatures from franchise legends. Spotlight parallels are available in four levels numbered to 50 or less. 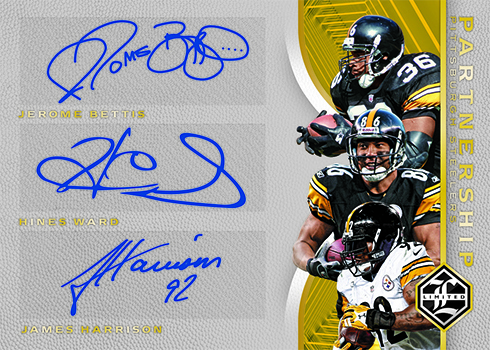 2018 Panini Limited Football has some multi-signature inserts as well. Partnership Duals and Trios (/50 or less) combine ink two or three players from the same franchise. Six Star Signature Booklets (/25 or less) are similar except they have six autographs. The Green Bay Packers and Dallas Cowboys are among the teams on the Six Star Signature checklist. Rookie Phenoms (/99) don’t have an autograph but the memorabilia swatch is on the large side. 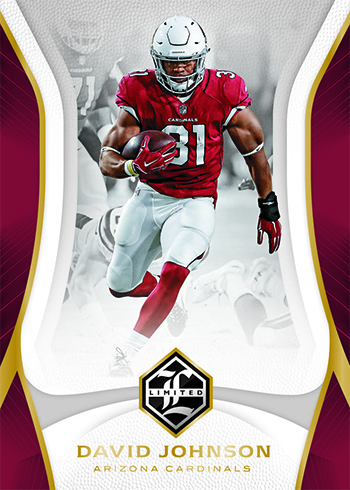 Spotlight parallels include Silver (/75), Gold (/50), Ruby (/10) and Sapphire (1/1).